Nearly a year has elapsed since the New Horizons spacecraft flew past Pluto and captured the first high-resolution images of this mysterious dwarf planet. Far different from the cold, dead, 4.5 billion-year-old mass that secular astronomers anticipated, these images revealed a world of astonishing diversity. Once again, science has confirmed biblical creation, demonstrating that the surface of Pluto is young, with evidence of recent geological activity. Around this time in 2015, New Horizons was fast approaching Pluto. It was already close enough to take clearer images than any ground-based observatory had achieved—even surpassing the clarity of the Hubble Space Telescope. But the real excitement came on July 14-15 when the spacecraft made its closest approach. New Horizons began recording ultra-high-resolution images of the most distant object ever visited by spacecraft. Since Pluto rotates only once every 6.39 days, the New Horizons spacecraft could only capture one side of the dwarf planet in high resolution during the close flyby. By providence, the side it captured had a most interesting and unexpected terrain: an enormous heart-shaped feature, nicknamed Tombaugh Regio after Pluto’s discoverer, Clyde Tombaugh. Secular astronomers expected that Pluto’s surface would be saturated with craters due to countless impacts over billions of years.1 But Tombaugh Regio has virtually none. Instead, the region exhibits a quasi-polygonal tile pattern, unlike anything seen on any other planet or moon.2 Astronomers now believe that this pattern indicates some type of convection—the circulation of material due to heat. New Horizons images revealed other interesting geological features on Pluto. Mountains as large as the Rockies stretch across its surface, but they’re made of water-ice instead of rock.3 The spacecraft also captured cliffs and enormous canyons, what appear to be frozen lakes of nitrogen,4 and even evidence of past volcanic activity.5 This geology indicates that the surface was once active with motion driven by internal heat. Apparently, Pluto was warmer when the Lord first created it. Such geology cannot be billions of years old. Otherwise, countless impacts over billions of years would have obliterated such terrain. But this presents a problem for the secular view. How would Pluto have any heat left if it were billions of years old? Being a very small world, only two-thirds the size of Earth’s moon, Pluto cannot retain heat for billions of years. It certainly doesn’t get much energy from the sun—less than one thousandth of what the earth receives. The only thing we know of that could (in principle) generate heat over billions of years is radioactive decay. Some of the heaviest elements like uranium are radioactive and produce heat. But from Pluto’s low density, we know that it simply cannot contain very much radioactive material—not nearly enough to produce the geology seen on its surface. The most natural explanation is that Pluto is only a few thousand years old. Pluto’s largest moon, Charon, also displays geology indicative of internal heat. It has mountains and canyons of its own and a mysteriously dark north pole.6 The other four moons are tiny and irregularly shaped and orbit in nearly perfect circles around Pluto’s equator. They rotate surprisingly fast, and one of them, Nix, even rotates backward relative to its orbit.7 Yet, secularists believe such rotations should have slowed over billions of years. These are perplexing problems for secular formation scenarios. However, Christians delight in seeing the Lord’s creativity continually revealed. Creationists expected to find some craters, of course. God may have used some process to make the heavenly bodies, and there have been impacts since creation. But we also expect evidence of youth. And this is exactly what we find on Pluto. NASA’s New Horizons Discovers Frozen Plains in the Heart of Pluto’s “Heart.” New Horizons News Center. 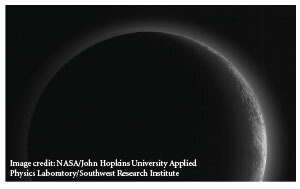 Posted on pluto.jhuapl.edu July 17, 2015, accessed April 6, 2016. From Mountains to Moons: Multiple Discoveries from NASA’s New Horizons Pluto Mission. New Horizons News Center. Posted on pluto.jhuapl.edu July 15, 2015, accessed April 6, 2016. Pluto: On Frozen Pond. New Horizons News Center. Posted on pluto.jhuapl.edu March 24, 2016, accessed April 6, 2016. At Pluto, New Horizons Finds Geology of All Ages, Possible Ice Volcanoes, Insight into Planetary Origins. New Horizons News Center. Posted on pluto.jhuapl.edu November 9, 2015, accessed April 6, 2016. Howett, C. New Horizons Probes the Mystery of Charon’s Red Pole. Pluto New Horizons NASA blog. Posted on blogs.nasa.gov September 9, 2015, accessed April 6, 2016. Cofield, C. Pandemonium! Motion of Pluto’s Moons Perplexes Scientists. Space.com. Posted on space.com November 10, 2015, accessed April 6, 2016. Cite this article: Jason Lisle, Ph.D. 2016. Looking Back at Pluto. Acts & Facts. 45 (6).